The app for the biggest network in the world is now installed on 70 percent of these Apple smartphones. A newly released report is underscoring the fact that social media marketing is an ideal fit in the mobile environment, as it discussed the considerable role played by Facebook on one of the top smartphones worldwide, the iPhone from Apple. The report looked into the importance of the network on this popular mobile device. This publication was created with data that was gleaned from Benedict Evans, an analyst from Enders Analysis. It helps to provide a more thorough understanding of the influence that social media marketing has on mobile commerce and consumer behaviors. 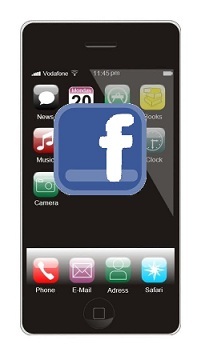 Specifically, it looks at the relationship between the use of the Facebook app and the iPhone smartphone. The social media marketing app is easily among the most commonly used on a worldwide scale. Back in September 2012, Evans had released the social media marketing news that Facebook’s smartphone app had achieved 470 million users. That said, it was its use on the iPhone that was especially important, as it was those users who were especially likely to download the application. At that point, there were already more than one billion people registered with Facebook. The install base on iPhones in that month was an estimated 200 million. The recent social media marketing report has been able to extrapolate from this information that there is, therefore, a tremendous 70 percent market penetration among the users of that device. This also means that the social media marketing app penetration of Facebook within iPhone devices is considerably higher than that among Android smartphone users. The report suggested that this could be an issue of geography, as many users of Android devices live in emerging markets where the use of the social network is considerably lower.